It’s that time of year again, I am packing up my important papers and personal things that I really don’t want to lose. It’s Southern California and I’m preparing for fire season. I am a lucky one, even with four evacuations under my belt in eleven years. Many of my friends and I’m sure many of yours have not been so lucky. Wildfires have become a way of life in a strange way. From having all your precious things in boxes at the door ready to throw into the car at a moment’s notice, to that network of people you have on speed dial when you see that plume of smoke hit the sky. Which elderly neighbors need help, who has horses but no trailer? These are just a few of the myriad of thoughts that go through the minds of people who have lived through wildfires. Today I would like you to meet two people who have met these challenges head on. Teresa you and Disaster Relief are no strangers. Can you tell me what Disaster Relief means to you? There are many phases of disaster including immediate relief/response, long term recovery/rebuilding and preparedness. The area I have been most involved with is long term recovery which is just that – long term! Immediate relief is usually very well taken care of with many agencies and individuals involved with supplies and sheltering. Community led long term recovery is where groups of community leaders come together to bring resources to their community such as insurance advocacy, rebuilding expos, organization of volunteer labor, fund raising, unmet needs committees, etc. This is typically a 2 year process, although sometimes longer, depending on the magnitude of the disaster. What was surprising to us is that while immediate relief is very well organized, there really isn’t an agency or any ‘plan’ for long term recovery. A bag of clothes, water and food is fantastic, but if you don’t have a home to live in at the end of the day……. What’s going on in Southern California since the fires? In San Diego, the communities have come together and there are resource centers located in each of the fire affected communities with funding through the San Diego Foundation. There are weekly insurance meetings, rebuilding workshops through the County of San Diego, and our unmet needs committee has held its first meeting. Volunteer labor (Mennonite Disaster Services, etc.) will likely be here in October to begin the first round of rebuild projects (safe, sanitary homes for the most at risk families who have gone through FEMA, SBA, Case Management and the unmet needs table for assistance. Are there ways people can get involved in helping? Yes – there are going to be many projects where volunteers are needed, such as clearing brush from properties for the elderly and at risk who are unable to do it themselves. Teresa, why does it take such a long time for people to rebuild their Homes? After a disaster, 95% of survivors find they are underinsured. The underinsurance can range from a small percentage to severely underinsured, through no fault of their own. When you call to get an insurance quote, even if you ask for full coverage, they know you are shopping around, so the agents tend to ‘underbid’ so they will get your business. Then when the gigantic binder comes, very few people have the time or expertise to read the entire thing. Even very intelligent, wealthy people are surprised to learn they are underinsured. With a regular one-on-one house fire (that seems strange to say!) the underinsurance may not be as noticeable. But, after a disaster, the demand for building materials increases as well as for architects and contractors, so what may have been $125/sf to build may jump to 155/sf, for instance. Two income families with ‘disposable’ income typically have the ability to take out a loan while they pursue their insurance company and / or litigation. We found that families in the backcountry were less likely to have the ability to do that. Some of the ’03 survivors are just now getting back home and some have not. These families are in the worst position. The long term recovery committees and agencies assist all families with insurance advocacy, rebuilding workshops, etc., but with unmet needs and volunteer labor groups, there is a criteria of working with the most at risk families (elderly, disabled, widowed, uninsured, etc.). After the ’03 fires, we only had one family that didn’t have insurance because of ‘philosophical “reasons. Most low income individuals simply could not afford it. Elderly on fixed income had to choose food or insurance – it was not that they were being irresponsible. Others were simply unable to get insurance because of where they lived. If people would like to volunteer to help in some way, who should they contact? For San Diego, it is Volunteer San Diego who will be ‘brokering’ all of the misc. volunteer activities. Last time, we had a volunteer coordinator but it was too much for one person, and Volunteer San Diego does this as their normal life. Is there any other individuals or agency that could be of service to people still needing help? George Kehrer is a gem. He is an attorney and was a general contractor. He and his wife lost their home in the Oakland Fires and after discovering the horrific problems with underinsurance, they began their insurance advocacy group. They assisted us with families in Katrina as well carehelp.org is his website. He has all of the insurance quote programs on his laptop and can sit down with survivors and make sure they receive maximum benefits from their policies and many times, can get more than the policy limit. Joe how did you become involved with the Red Cross? I became a Red Cross Volunteer sort of by accident. On the Friday after the 9/11 attacks I couldn’t take just sitting home in Jersey so I went in to Manhattan and met up with a friend who lived there. That night we decided to walk along the Westside Highway towards Ground Zero. Maybe because of my government NOAA sweatshirt and big camera bag we were able to walk right through 3 checkpoints and ended up at the Red Cross Center. It was set up in a public school building just behind the Pile. They were short staffed as you can imagine so we lent a hand. We ended up being there for about 8 hours until dawn. Tom, the director, thanked us and said that he could probably use us again later that next day but had no way of getting us credentials. Somehow despite tightening security we were able to work our way back. He smiled when he saw us and shook his head in disbelief. Later that day we were able to sign up at the Red Cross Center further uptown and became official. I’ve been with them ever since. What other disasters have you helped with? Ground Zero, two floods in Jersey, a few house fires in Jersey, Waveland, Mississippi after Katrina (we were the first Red Cross team to reach the town center), and of course the school evacuation center right here in Borrego Springs during last year’s fires. I’m very conflicted right now because they desperately need Red Cross people to head for the Midwest but I just can’t do it because it is a very critical time with my business and they need at least a two-week commitment. 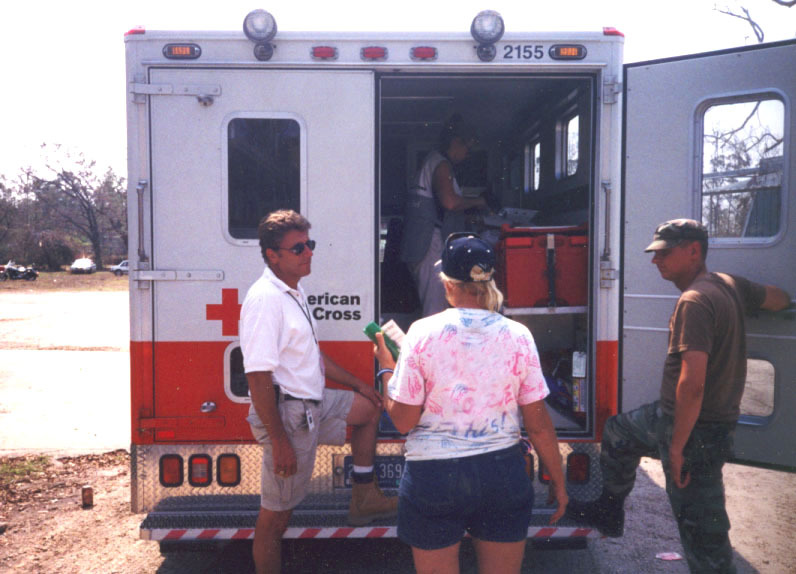 What is the best part of being a Red Cross Volunteer? I’ve ever had. I look forward to every aspect of it. To Teresa & Joe and all the amazing people who step up to the plate when others need it most we thank you from the bottom of our hearts. If you would like to nourish your heart and soul and volunteer you can read about opportunities at redcross.org or at any of the other organizations mentioned in this post. You can also learn a little more about the longer term disruption that disaster causes by checking out the new tv series on Greensburg post the 2007 tornado that wiped out the whole town. I was in Pacific Beach during the fires of 2003, and can remember waking up on a Sunday morning, only to find that the skies had been scorched. Ash was floating onto the patio, softly and without a sound. For a moment, I convinced myself that it might be snow. Three or four of us holed up inside for the next couple of days, watching the news and screening movies. By Tuesday, I had finally had enough. I got in the car and starting driving east towards Arizona. Only then, driving out of San Diego along Highway 8, did I truly comprehend the damage. After reading this entry, I was forced to look back on that experience, and I’m sorry to say that I never thought to volunteer. I suppose I assumed that it was a job for those with particular training–fire fighters, for instance. Having had the chance to read about Teresa and Joe, I would hope that if I should ever encounter a similar situation, I’ll choose a different path. I to find this matter to be actually one thing that I think I might by no means understand. read articles from other writers and practice something from other web sites. An outstanding share! I’ve just forwarded this onto a co-worker who had been doing a little homework on this. And he in fact ordered me breakfast simply because I discovered it for him… lol. So allow me to reword this…. Thanks for the meal!! But yeah, thanks for spending some time to discuss this subject here on your web page.